In the field of elder care, music has been explored as a way to encourage social interaction, encourage self-expression, and enhance the overall well-being of assisted living residents who fight illnesses such as Alzheimer's, dementia, memory loss, and other cognitive impairments. So through music, Spring Arbor has found that residents with these health conditions are able to live more fully. They are not defined by their conditions or their need for medicines and skilled medical care. They become engaged members of a supportive community that encourages emotional growth, sharing, and self-worth. This can be vitally important to seniors who experience a number of difficult life events such as retirement, the death of a loved one or spouse, and the need for help with common tasks. So far, experts know of no other single activity that stimulates the entire brain. In addition to this, music increases dopamine levels, and dopamine can cause a corresponding positive sense of well-being. So what does it mean to say that music promotes well-being? Well-being is characterized by a sense of affiliation. Seniors feel connected and have an increased sense of belonging. 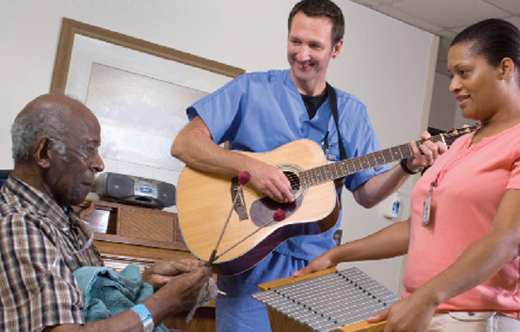 Music also brings about a feeling of self-competence and independence in seniors. They enjoy life day-to-day and gain a greater sense of fulfillment. Many research studies indicate that musical activities have several positive benefits. Patients are reported to have better moods, be more sociable, eat better, and react more calmly to stress. Experts say it’s the “cognitive workout” for the brain that brings on these positive traits. Feel free to contact us to learn more about assisted living and how life at Spring Arbor can be relaxing fulfillment.